Composer John Harbison is among America's most distinguished artistic figures. 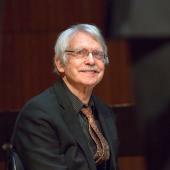 The recipient of numerous awards and honors, among them a MacArthur and a Pulitzer, Harbison has composed music for most of America's premiere musical institutions, including the Metropolitan Opera, Chicago Symphony, Boston Symphony, New York Philharmonic, and the Chamber Music Society of Lincoln Center. His catalog includes three operas, six symphonies, twelve concerti, a ballet, five string quartets, numerous song cycles and chamber works, and a large body of sacred music that includes cantatas, motets, and the orchestral-choral works Four Psalms, Requiem and Abraham. His music is widely recorded on leading labels. In December Harbison’s opera The Great Gatsby received its European premiere at Semperoper Dresden, with a revival there planned for May 2017. Gatsby has previously been heard in New York, Chicago, San Francisco, Aspen, Boston and Tanglewood. Recent premieres include Seven Poems of Lorine Niedecker, String Trio, For Violin Alone, and Supper at Emmaus. Harbison’s current composition projects include a work for cello and strings, a clarinet trio, Longfellow settings for viols and countertenor, his sixth string quartet, and a monodrama.